Natural and soothing ointment to alleviate problematic skin and restore visibly healthier skin for your baby. Enriched with unique natural ingredients, it has curative properties that hydrates baby's dry and sensitive skin, reduces itching, calms and heals eczema ensuring baby is comfortable at all times. Vitamin E, Almond and Olive Oil nourishes skin cells whereas chamomile soothes and clears up skin irritations. Essential oils and herbal actives having antifungal, antibacterial and antiseptic properties not only prevents eczema but also leaves the child with a clear soft supple skin and generates ability in skin to retain moisture. Explore the entire range of Creams, Lotions & Oils available on Nykaa. 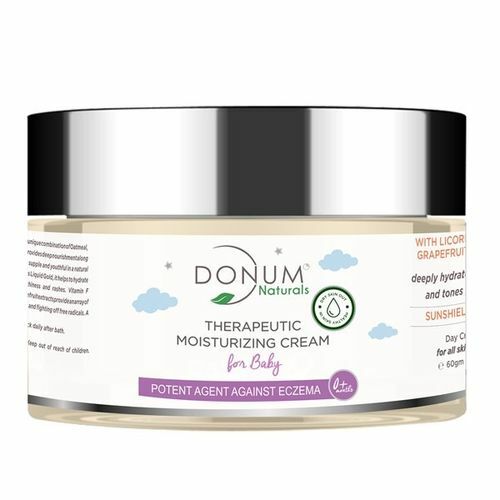 Shop more Donum Naturals products here.You can browse through the complete world of Donum Naturals Creams, Lotions & Oils .